MESH TRUCK COVERS by SUPERTEX, INC., are a knitted fabric, Made in USA, at Our New North Carolina facility. We are SUPERTEX, INC. (www.supertex-inc.com) Established in 1982. 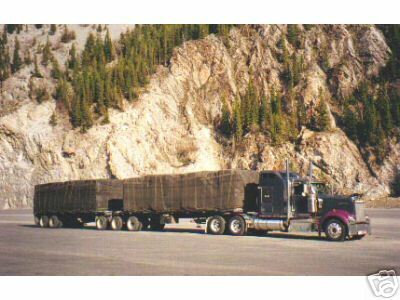 MESH TRUCK COVERS By SUPERTEX, INC., Have Been Used on Trucks to Cover Open Loads of All Types For More Than Twenty Years. Made of Black Mesh Polypropylene Fabric, These Mesh Truck Covers are the Most Practical, Efficient, Durable, and Cost Effective Load Covers Available Today. MESH TRUCK COVERS By SUPERTEX, INC.. Have Been Used Nationally and Internationally for More Than Twenty Years, Providing a Quality, Durable Cover on Open Loads of All Types. These MESH TRUCK COVERS By SUPERTEX, INC., Are Regularly Used to Cover Truck Loads of Sod (Turfgrass), Nursery Stock, Cardboard, Recycling Materials, Demolition Debris, and Hazardous Waste. Our MESH TRUCK COVERS By SUPERTEX, INC., Product is Also Being Used As a Synthetic Shade Cloth in Various Settings. Some Current Uses are to Provide Shade Cover for Livestock, Kennels, Nursery Stock, Fruit Bushes, and Trees. MESH TRUCK COVERS By SUPERTEX, INC., Made of Black Polypropylene Mesh Fabric, are the Most Practical, Durable, and Cost Effective Covers Available Today. From a Safety Standpoint, the MESH TRUCK COVER By SUPERTEX, INC., Holds Your Load in Place During Transit, Preventing Spillage Onto Roadways or Onto Passing Vehicles. Most States Now Require Covering Open Loads and Our MESH TRUCK COVERS By SUPERTEX, INC., Meet This Covered Load Requirement. Please Note: MESH TRUCK COVERS By SUPERTEX, INC., Do Not and Is Not Intended to Meet the "Federal Secure Load" Requirements. We Look Forward to Hearing From You or Receiving Your Orders For Our MESH TRUCK COVERS By SUPERTEX, INC. We Are Confident That, Like Our Many Other Customers, You Will Find Our MESH TRUCK COVERS By SUPERTEX, INC. Product Easy to Use and Long Lasting. Whether Using Our Product to Cover an Open Truck Load or To Provide an Area With Shade, We Are Sure You Will Love It. 100% SATISFACTION GUARANTEED. NOW See Our Newest Acquisition: www.AmericanTruckProducts.com For A Complete Line of Fabricated Truck Tarps.